IMPORTANT: National Geographic Islander cruises must be reserved over the phone. Call us for more information. National Geographic Islander, launched in 2004, spends the year exploring the Galapagos Islands off the Pacific Coast of South America. Carrying only 48-guests, the quaint size allows the perfect setting for adventure, exploration, and discovery. Guests who enjoy nature, wildlife, and learning will have the trip of a lifetime onboard National Geographic Islander. Joining guests on every voyage of National Geographic Islander will be a number of experts coming from a variety of fields. Expert photographers will teach guests how to use the right setting and techniques to capture perfect wildlife pictures, like those seen in National Geographic magazine. Naturalists and biologists will provide nightly lectures on the sights and sounds of the day's tours. Professional divers will provide guests with a view of what lies beneath the water surface. As part of the effort to promote conservation and "Eco-Travel", National Geographic Islander uses only sustainable local ingredients. This ensures that the environmental impact of every voyage is kept to an absolute minimum. 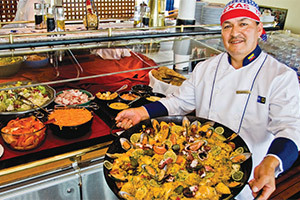 Chefs onboard are experts at taking fresh local ingredients and turning them into delicious dishes for guests to enjoy. All excursions and explorations on National Geographic Islander are included in the cruise price. That means guests get to spend more time experiencing and less time worrying. From wildlife viewings to visits with local peoples, all will be provided for you. 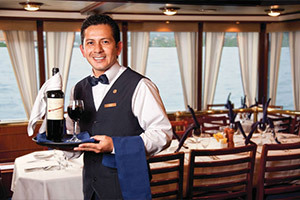 Huge Discounts & Low Price Guarantee on all National Geographic Islander Cruises! Book any National Geographic Islander cruise with us and you'll get the best deal possible, regardless of the ship or sail date! Because of our huge price discounts and "Low Price Guarantee," nobody beats our National Geographic Islander cruise prices, so look around and you're sure to find the best National Geographic Islander cruise deal possible when booking with us! We do not charge booking fees on any cruises! You're sure to enjoy an affordable National Geographic Islander cruise when booking with us! Our special offers on National Geographic Islander cruises may not be combinable. Certain restrictions apply to each offer. View terms and conditions during the online booking process. Two spacious Suites onboard National Geographic Islander feature wraparound view forward over the bow and off to the side of the ship. Balconies feature a glass-in terraces for wide outside views. Oceanviews feature windows for outside viewing. The deck plans of National Geographic Islander provided on this page are subject to change. We reserve the right to correct errors. Please verify all information with Lindblad Expeditions directly.